New report charts the university’s progress toward various sustainability goals, looks ahead to continued opportunities for GW as model of urban sustainability. Solar power projects, new environmentally friendly buildings, waste and water reductions—the last decade at the George Washington University has been marked by significant sustainability achievements, according to a new university report released Friday. The report documents GW’s progress since 2008 in seven areas identified in the university’s overarching sustainability plan, “The Ecosystems Enhancement Strategy:” natural space, air and climate, fresh water, food, waste, urban environment and investment. According to the Office of Sustainability, much of the progress has been made through daily efforts across the GW community. The report takes into account the impact of small actions such as recycling as well as more significant actions. 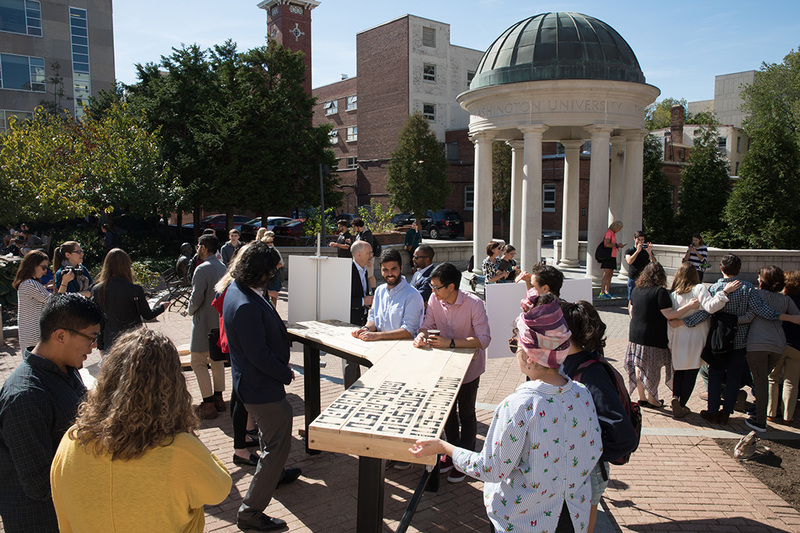 Through the Green Office program, staff leaders across the university commit to a suite of sustainability measures in GW spaces, while many faculty and students provide ideas, passion and influence on sustainability issues across the campuses. In promoting healthy air and climate, the university saw a 28 percent decrease in greenhouse gas emissions between 2008 and 2016, thanks to LEED-certified buildings and a renewable energy project that has made the university 50 percent solar-powered. GW remains on track for a 40 percent reduction by 2025 and will strive to become carbon neutral by 2040. While many may not notice the energy-efficient lighting or be able to see the solar thermal hot water systems (they’re on top of residence halls and other campus buildings) or the 243,000 solar panels generating renewable energy (they’re installed at three sites in North Carolina) plenty of GW’s progress in landscaping, waste, water and food is proudly displayed on campus. A solar thermal system on The Dakota. The university works to enhance natural ecosystems by increasing campus green space, in alignment with its Sustainable Landscape Guidelines developed in partnership with students and faculty in the College of Professional Studies, with lush plant life grown without any pesticides. When possible, impermeable surfaces, such as parking lots, are transformed into green spaces that reclaim water, such as Square 80. GW has installed more than 60 water bottle filling stations on its campuses, which has resulted in 780,000 reusable bottles filled, greatly reducing the use of disposable water bottles. Campus storm water collection also directs water where it can be best used—irrigating plants or even providing water for toilets or decorative fountains. The university and students partner to maintain the GroW Garden, which contributes 1,000 pounds of sustainable, local food every year to help provide meals to the homeless. At the same time, the university has greatly reduced the waste it sends to landfills—there has been a 19 percent decrease in tons of waste sent since 2006—while increasing recycling, reuse and composting for a total diversion rate of 35 percent. GW also invests a portion of its endowment in funds that include renewable energy, sustainable farming, carbon offsets, energy efficiency and clean energy solutions. In 2016, more than $21 million was invested in funds with sustainability-focused and community-oriented initiatives. GW provides programming for students to take action on sustainability. The Eco-Equity Challenge is a community engagement program, while Eco-Challenge and “Charged Up,” are on campus. Through the Charged Up competition, students win the ability to design a solar charging station for small electronics. A new charging station was even installed on Kogan Plaza this week. 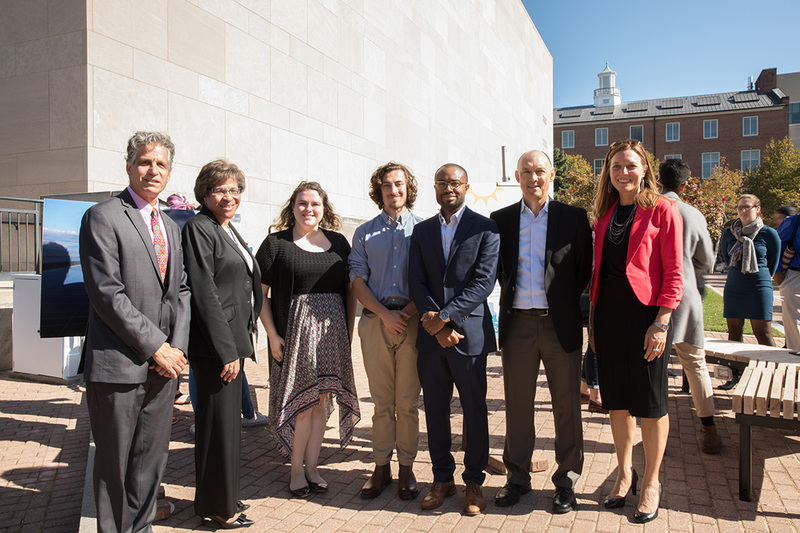 As part of all of the university’s efforts, leveraging its student energy, faculty and staff expertise, and its power as a convener and leader in sustainability remain critical for continued progress. “Looking ahead, the university will dive deeper into how it uses fresh water and identify additional reduction opportunities,” Ms. Chapple said. “The landmark Capital Partners Solar Project will continue to provide a living lab for students in engineering and a model for institutions seeking to purchase large-scale renewable energy. Another focus will be continuously expanding sustainable purchasing, such as with office supplies. And most notably, the university will develop an adaptation plan to prepare for the weather, infrastructure and health impacts that come with a changing climate." 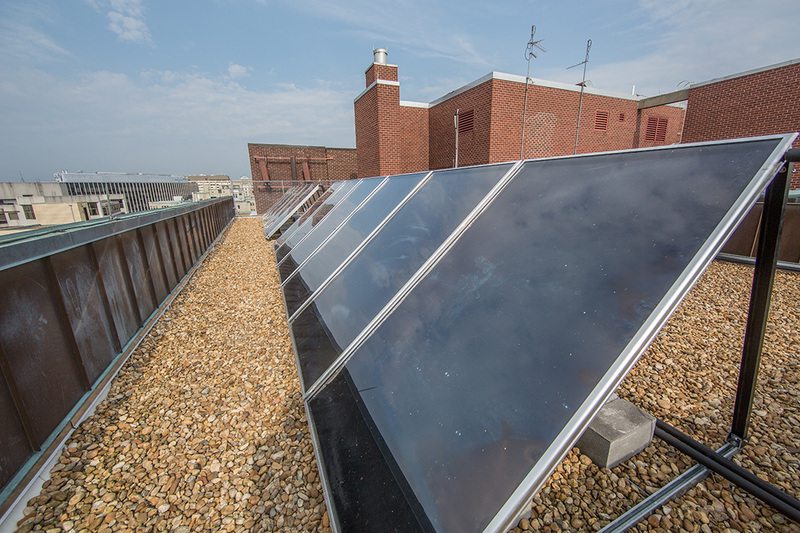 The Capital Partners Solar Project and other green initiatives have made GW a leader for sustainability in higher education.